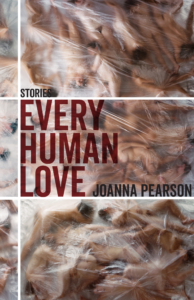 Imaginative and haunting, Every Human Love is a masterful collection of short stories by Joanna Pearson, written with insight and empathy. The characters—students, mothers, interns, teachers––are resilient but wounded. In “The Romantics,” a woman begins teaching at a private school as her handsome, charismatic cousin moves into her home as a boarder—and begins stealing from her. She struggles to come to terms with a scandal from her recent past: “I’d misread everything, mistaken enemies for friends and friends for enemies.” With each layer, her story becomes more opaque and resonant. As that character reveals, “I’ve learned nothing if not that people are complex.” A similar theme animates other stories. Characters’ lives are fraying, as likely to unravel as they are to heal. In “Rumpelstiltskin,” a women desperate for a child makes a sinister arrangement echoing the dark fairy tale, while in “The Changeling,” a mother leaves her newborn in the hands of a dubious stranger. In both “The Undead” and “The Scare,” mothers grapple with children who are fragile, sensitive, and different. One child is obsessed with vampires, the other with clowns. These chilling stories reveal as much about the mothers’ vulnerable psyches as about their children. Pearson’s writing is spare and sparkling. In “Ouro Preto,” a student spends her summer searching for diamonds with a quirky geologist while she reflects on her recent failed relationships: “I still held a fierce wish for the world to be tied together in neat loops and bows.” She considers whether the poet Elizabeth Bishop searched for the “liquid light” of gems: “No, I decided. She had a cache of her own, polishing simple words until they glittered like her famous fish. I envied her that. Rainbow, rainbow, rainbow! Diamonds refracting light into a hundred hundred colors.” The same could be said of this powerful collection. In its dark, often lonely lives, there’s a strength, a lucidity, and a brilliance that shimmers and enchants.